Doing SEO Keyword Research - AIMWEB Global Web Solutions - Leaders in Search Engine Optimization, Pay Per Click Management and Search Engine Marketing. Cape Town, South Africa. The most important thing before taking a journey into a successful SEO campaign is to place yourself in the shoes of your potential customers and to ‘understand’ what it is that your potential customer is most likely to be searching for when they are looking for the products and/or services that you are offering, but know nothing of your business and its name. Write down a list of keywords and keyword combinations. Try to focus on two to four keyword combinations in order to ‘narrow down’ the search. For example, if you are a used car dealership, you might be inclined to target the word ‘car’. However that would be a bad idea due to the fact that people that actually search for the word car might be looking to buy a new car or maybe to repair their car. A much better keyword combination would be to use for example “buy used cars online” as this will bring a much more targeted client based which will be targeting the ‘niche’ that your business is in. There are a few tools available to you that can assist you with understanding what your potential customers are searching for when looking for the services that you offer. The most popular tool in Google Ad-Words. Although this tool is targeted primarily at the ‘pay-per-click’ advertising model, the keyword tool available from Google Ad-Words is free and will be able to assist you in getting the right set of keywords to target. 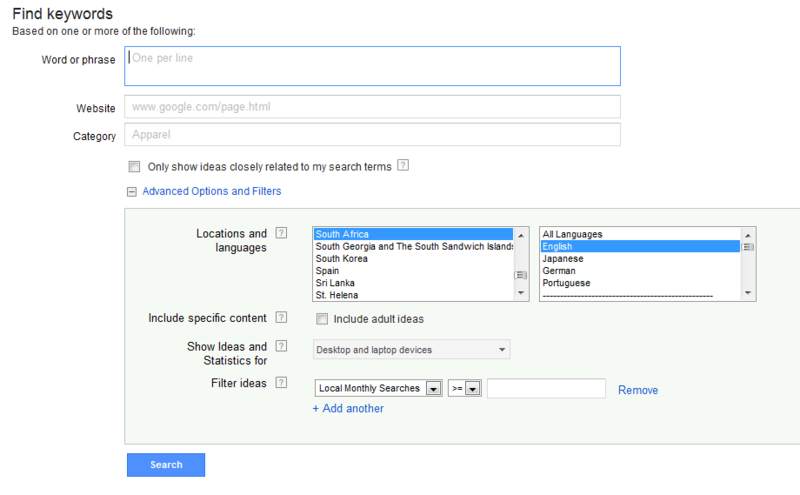 The Google Ad-Words keyword tool is located under the ‘Tools and Analyses’ section in the Google-Ad Words main interface. Here you will need to type in one or more of the keyword combinations of your choice, expand the ‘Advanced Options and Filters’ menu and select ‘Locations and languages’ as well specify ‘Exact’ keyword search on the left hand side of the screen. Also, you may find it very useful to add the ‘Trends’ column that will show you the local trend statistics from month to month. Once you have the set of keywords and keyword combination that you are going to optimize for you are ready to start with the search engine optimization of your website. It is a good idea to document the list of keyword together with the average number of monthly search as well as the local trends (if these are applicable to your business) on an excel spreadsheet as these will come in useful when you are optimizing your website. AIMWEB is a leading industry expert in Search Engine Optimization. Please give us a call on 021 557 1595 should you wish to find out more information regarding the above article and the SEO packages offered by AIMWEB.